Stand up paddle boarding isn’t just for people who are fit and at their ideal weight. In fact, people of all sizes and weights can enjoy taking the SUP out on the water. However, heavier people do have to shop for a SUP with a higher weight limit for the best experience. Fortunately, there are several great boards on the market that can accommodate overweight paddlers. Often, you have to buy a longer board, but there are a few short boards with high weight limits. See the best SUPs for heavier people below. As you can see, there are quite a few good options out there for those of you who weight over 250 pounds. 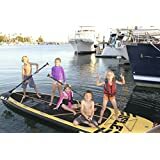 One thing to keep in mind as you shop for a new stand up paddle board is that you get better stability out on the water on boards that are thicker and wider. And often, people find that longer boards are easier for them to stand on (they longer boards are also great for using in the ocean for a bit of small waves surfing). Most of the boards on the list above are all arounder SUPs, which means that they perform well in all types of water conditions. The racing boards tend to be designed to move you through the water faster, if that is important to you. This is the SUP with the largest weight limit at an amazing 1200 pounds! 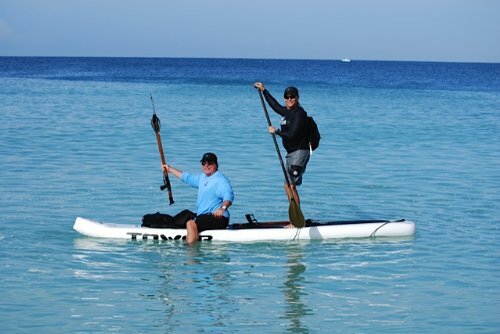 That is because it is designed to carry multiple paddlers at the same time for tandem paddle boarding. However, it can be used by a single person who is overweight and needs a board with a big weight capacity. Of course, if one of the other boards on the list is a better fit for your weight limit, then you should go with it as this board might be too big for you otherwise. This is an inflatable SUP, which means that it is easy to transport and travel with, as well as store when not in use since it rolls up to be about the size of a sleeping bag. It also comes with four paddles, which is nice to have if you want to take someone out on the water with you. It also comes with a pump, fins and carry handle. So, basically everything that you need to get out in the water when it arrives. The Isle Megalodon iSUP is a great paddle board – very high quality construction and it performs well in the water. The board has an All Around design, which means that you can comfortably use it in any water conditions with good results. It features D rings and a bungee so that you can store a dry bag and other things. All three fins can be removed, which makes it easy to transition from the ocean to the river and still have a great experience. You can even use this iSUP for fishing since it has so much room for your tackle box and a seat. If you weigh over 400 pounds, then the Tower Xplorer 14′ iSUP is probably the best choice for you out there right now. Tower Paddle Boards is known for making some of the best SUPs on the market and this model is a perfect example of that. This board can support up to 700 pounds and comes with a pump and adjustable paddle. It has very high quality construction, so you can expect it to last you for several years to come. And, it has an affordable price for the money. This is also an inflatable model, which means that you can roll it up to about the size of a sleeping bag when you’re not using it. That makes it easy to store out of the way or to transport with you. The shape of this iSUP makes it perfect for racing and touring. It moves quickly through the water and is great for those long afternoons paddling. And since it is so long, there is enough space for you to take your dog or kid out there with you in the water. Overall, this board is very stable in the water and a lot of fun to use. Plus, the quality is high and it’s made by one of the top brands when it comes to paddle boards. Definitely check this one out if you meet the weight limit requirements. 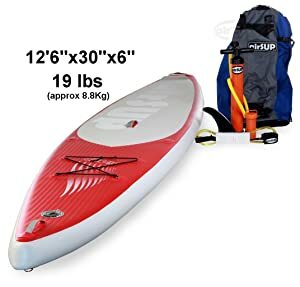 This airSUP board is a good choice if you want a cheap stand up paddle board for heavier people. Unless you’re surfing, the weight limit is 400 pounds. For surfing, it’s only 220 lbs though so you’ll want to get a different board if you wanna surf some waves with your iSUP. 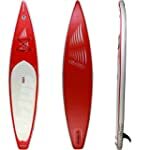 This inflatable SUP comes with a pump, repair kit, fin and carry bag. So, there is no paddle included but that’s okay cause you can buy one for cheap on your own. Overall though, this is a pretty good value iSUP for the money if you are an overweight paddler. The design of this board makes it perform well in small waves as well as racing. But, it is also a great choice for your just your average flat water cruising – just keep in mind that if you want to take out in the ocean, then you can expect good things from the board when it comes to performance in the water. If you prefer a good iSUP that is a short board, then your best choice is the Tower Adventurer. 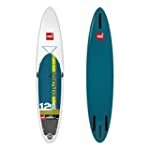 It is a great all arounder paddle board and it one of our top rated and best selling SUPs on the market right now. In fact, it’s hard to ind a better value for the money than this board right here. The weight limit on this one is 350 pounds, which is the highest of any of 10-foot SUPs. 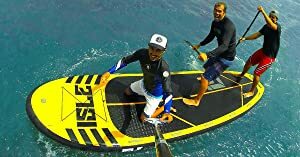 This is probably my favorite iSUP of all time because it gives you the ultimate performance in all types of water conditions and it is very stable because it is 6-inches thick. It almost feels like a hard board! 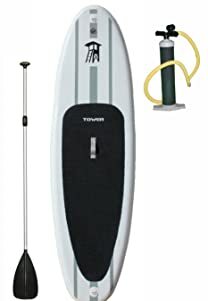 Tower has only been making paddleboards for a couple of years now, but they have quickly emerged as the industry leader when it comes to the highest quality iSUPs at the best prices. 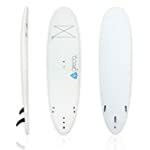 If you buy this board, or any of the other Tower Paddle Boards models, then you are getting something that you know will last you for many years to come. With this one, you get an adjustable paddle and a pump. I’ve already reviewed this awesome iSUP in the past, so if you want to read more about it, check out my review. 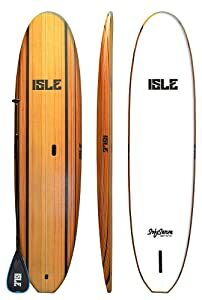 Another great choice for a short board iSUP for heavier people is this model from Isle. Overall, Isle makes pretty great paddle boards, but this one is the best for people over 200 pounds. The weight limit on this one is a little lower than the Tower Adventurer at just 275 pounds. Still though, it is a good choice for a lot of big guy and girls out there. Unlike the Tower Adventurer, this board is not an inflatable. It is a rigid board made out of a soft serve foam that is 5-inches thick. So, the stability is almost as good as the Tower iSUP and better than a lot of other SUPs out there. You actually get really good stability in all types of water with this Isle SUP. So, take it out on the river or in the ocean for some small waves. 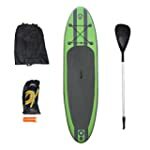 With this Isle stand up paddle board, you get an adjustable paddle, a carry handle, the removable fin, and a surf leash. So, basically you get everything that you need to immediately hit the water once this thing arrives at your home. And, it’s often cheaper than the Tower Adventurer!